Are you excitedâ€¦ maybe a little anxious? Is your special day quickly approaching? Do you feel like youâ€™ve fallen through the looking glass and the white rabbit is running circles in your head screaming â€œtoo much to do, too little timeâ€? Donâ€™t worry, sit back, relax, have a glass (or two) of champagne. Help is just a click away! As You Wish Weddings, Floral Creations and Event Planning is the largest and most professional wedding planning company in the Florida Keys and rated number one with the South Florida Better Business Bureau. Throughout the planning process you will be faced with many choices. Your selection of Wedding Planners is, in our opinion, the most crucial. Like most destination locations, Key West is a very transient town. With the invention of the internet, people, companies and places can easily be misrepresented. Why not let the experienced and reputable Wish Providers of As You Wish Weddings, Floral Creations and Event Planning ensure your wedding dreams become honeymoon realities? 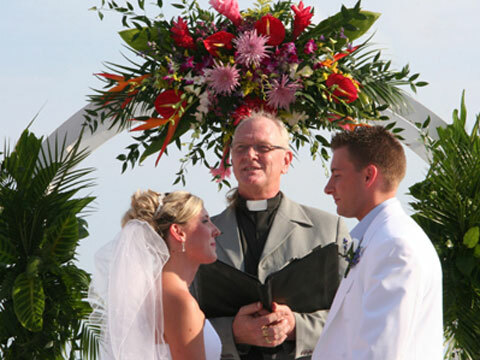 As You Wish Weddings is Key Westâ€™s â€œOne Stop Wedding Shopâ€. In addition to our kind, professional and extremely talented wedding consultants, our company sports its own full service floral department, travel and concierge department as well as the most up-to-date digital editing department available. By selecting As You Wish Weddings as your wedding consultant and allowing our Wish Provides to fulfill your wedding fantasies, most of your worries will float away. Flowers, photos, video, music, officiates, food and fantasy -- our company provides it all through our party size-based Booking Fee. Soâ€¦The next question you need to consider: Where do you picture yourself when you finally say â€œI Do!â€? On a romantic beach as the sun sets into the azure waters of the Gulf of Mexico? In a lush tropical garden surrounded by intoxicating perfumes? Or one of the many historical landmarks resonating with the charm of Old Town Key West? As You Wish Weddings, Floral Creations and Event Planning designs and oversees Weddings, Commitment Ceremonies, Vow Renewals, Receptions and unique corporate and social functions throughout Florida and its captivating Keys. Click here to see larger image Our philosophy at As You Wish is what sets us apart from other companies. Your planners take the time to get to know you and your intended. As You Wish Weddings, Floral Creations and Event Planning will design a ceremony and style that complements your personal love story, within the budget constraints you specify. Our unique Planning Guide is another feature that sets us apart from other companies. You may access the Planning Guide via the navigational bar above. This guide allows you to pick and choose from the many items our company offers, so that you can create the wedding that best represents you. Our planning guide serves as a budget estimator, showing exactly where each of your dollars is allocated. In addition to your ceremony, As You Wishâ€™s Travel Department can handle flight, rental cars, hotel or guesthouse accommodations for you and your guests. Please check out www.keysweddingstravel.com. Whether it is just the two of you, or 400 of your family and friends, we will help you plan a frolicking week of food, fun, frozen drinks, jet skis and sunset sails that satisfies your every need. Let us be your Key to unlocking the charm of Old Key West!